Have you ever noticed that often when Paul instructs the churches to pray he admonishes them to pray with thanksgiving? “Continue steadfastly in prayer, being watchful in it with thanksgiving“. . .”do not be anxious about anything, but in everything by prayer and supplication with thanksgiving let your requests be made known to God. . .”Rejoice always, pray without ceasing, give thanks in all circumstances; for this is the will of God in Christ Jesus for you” (Colossians 4:2; Philippians 4:6; 1 Thessalonians 5:16-18). 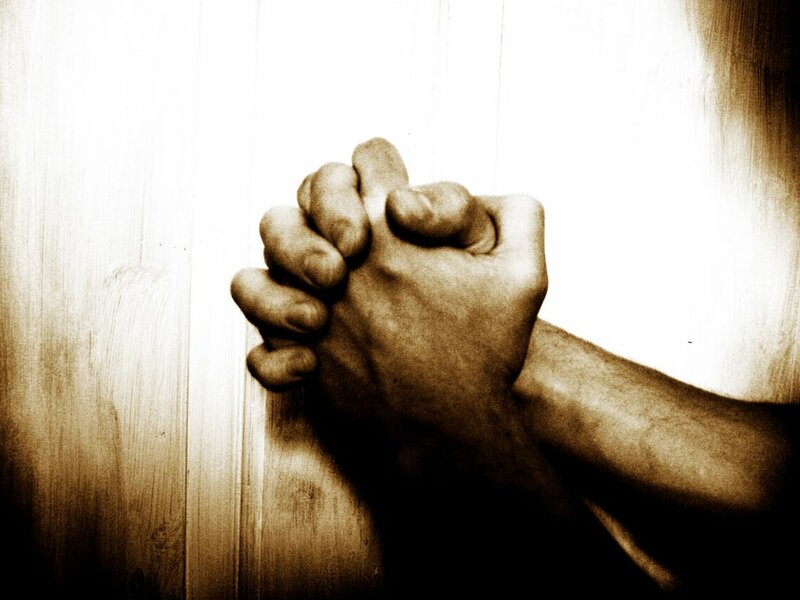 Why does Paul place such an emphasis on praying with thanksgiving? For at least two reasons: Because prayer with thanksgiving is a shield against fear and self-absorption. The one who never thanks God is easily given to fear and self-absorption. You see, thanking God for past and present blessings casts out fear and fuels confidence for future grace. This is why it is so important to pray thankfully. When you are daily reminding yourself of God’s grace to you in Christ and thanking Him for all of the temporal and eternal blessings that you have from his good and sovereign hand it encourages you to trust Him for the future. You can say, with confidence, “I know not what the future holds, but I know who holds it. . .He is a good God and he has proven it to me ultimately in Christ” (Romans 8:31-37). As Spurgeon notes, he is serving the “constant gratitude of his people”, including you! Have you noticed lately how he has served your gratitude daily and prayed thankfully? The sooner you start noticing his goodness to you in daily temporal blessings, and the all-sufficient eternal blessings that are yours in Christ by faith, the sooner you will stop worrying about the future. Gratitude is a shield against fear! This is why Paul says, “do not be anxious about anything, but in everything by prayer and supplication with thanksgiving let your requests be made known to God. And the peace of God, which surpasses all understanding, will guard your hearts and your minds in Christ Jesus” (Philippians 4:6-7). Notice the connection between the exhortation not to be anxious and to pray with thanksgiving. Prayer with thanksgiving is a vital element in the kind of prayer that casts out anxiety and experiences the peace of God which surpasses all understanding. And not only is gratitude a shield against fear it’s also a shield against self-absorption. The one who does not thank God on a regular basis is also given to self-absorption. Why? Because the blessings that they have they take for granted as if they earned them apart from God. It’s a form of practical atheism and a practical denial of our sinfulness and God’s grace. It’s also a form of idolatry as it worships the gift rather than the Giver. And thus, a lack of thankfulness is a turning within, a form of self-absorption. This is why we need to pray thankfully, namely because it’s a shield against fear and self-absorption. When we pray thankfully we live in confidence and are rightly absorbed with God and praising Him for who He is and what He’s done for us in Christ. And this is what will bring us ultimate delight and satisfaction in this life and the next. This past Sunday I preached on the fruit of compassion in the Christian life. My primary text was the parable of the Good Samaritan (Luke 10:25-37). 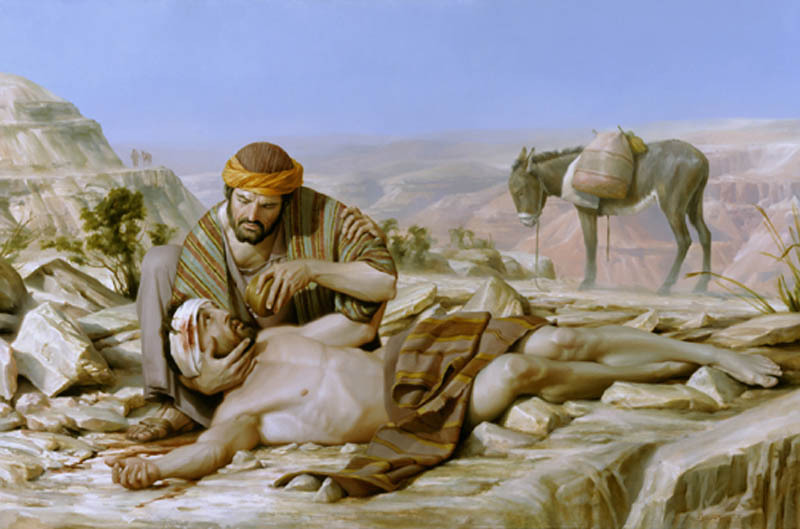 The point of that parable is not first and foremost, “stop being so cold and callous to your neighbors and start being more like the Good Samaritan.” No doubt we are commanded by Jesus to “go and do likewise” (v. 37). But this parable is given in the context of a lawyer (an expert in the Old Testament) who asks Jesus what he must do to inherit eternal life (v. 25). Indeed, it’s emphasized that he was seeking to justify himself (v. 29). And so, the point of the parable in the first place is to drive people who want to justify themselves by their own works to seek eternal life outside of themselves and to trust in Jesus Christ alone for salvation, because Jesus is our Good Samaritan. We fail miserably at loving others as we would ourself and by works of the law no one will be justified (Gal. 2:16; Rom. 3:19-26). But if we believe in Him, we already have eternal life and will be raised on the last day when Jesus returns (John 3:16; 5:24; 6:40). AMEN! Jesus is the Greater Good Samaritan! Indeed, He’s the greatest and the only one who has ever lived who is perfectly good! And so, when Jesus says, go and do likewise to us, it comes to us in a different context. It comes to us not as those who are seeking to justify ourselves by our own good works, but as those who are already justified by grace alone through faith alone because of Christ alone. We are clothed in his perfect righteousness and we have already passed from death to life through faith in Him. And so, our motivation to “go and do likewise” is “we love because He first loved us” when we were beaten, bloodied and left for dead. And if he had such compassion and mercy towards us, let us show the same kind of compassion and mercy towards others out of thankfulness for God’s amazing grace in Christ! In the Spirit’s strength and with the gospel fueling every effort, let us love anyone in need, anyone at all, whom in the providence of God we may be able to help, no matter what social status, no matter what religion, no matter what political party, no matter what nationality, no matter what gender, no matter what age, no matter if we like them or not, no matter if they are deserving of our love or not, no matter if its convenient or not to love them, and no matter if they have done us wrong in the past. Every person has been created in the image of God and by reason of their dignity as image bearers and even more by reason of the love of God that has been poured out upon us in Christ, we are to have compassion on them and love them as we would want them to love us if we were in need. But let us always remember that we are justified by faith alone, we have the Spirit’s enabling power, and we love because he first loved us (Rom. 3:28; Gal. 5:16, 22-25; 1 John 4:19). The first thing that we confess about faith is that faith is a gift from God. Saving faith is not something that we can, in and of ourselves, conjure up from within. Remember that the Bible describes our condition before conversion as being dead in our sins and trespasses. And so if we are to ever believe, God must first regenerate our hearts by his Holy Spirit. The way the Bible describes this is as a new birth or a spiritual resurrection, both of which are images of something that we can’t initiate or do. The same could be said of dead people. Dead people don’t do anything. They can decide to be raised. Lazarus didn’t say, “you know what I would really like to be resurrected by Jesus today, and so, I have decided to make myself alive again.” Nor did he say, “I hear you telling me to rise up and come forth Jesus, now that you’ve done your part, I will now do mine.” I mean these things are just funny and absurd to think about. “Peace be to the brothers, and love with faith, from God the Father and the Lord Jesus Christ” (Eph. 6:23). “One who heard us was a woman named Lydia, from the city of Thyatira, a seller of purple goods, who was a worshiper of God. The Lord opened her heart to pay attention to what was said by Paul” (Acts 16:14). More verses could be given. But these are enough to prove that our confession is based on what the Bible clearly teaches. And so we confess that: “We believe that, to attain the true knowledge of this great mystery, the Holy Spirit kindles in our hearts an upright faith” (Belgic Confession of Faith, Article 22). That doesn’t mean that God believes for you. Rather, once God makes you alive you are the one who believes. It’s like when a blind person is given the gift of sight again. Once that miracle takes place they are the one’s seeing. But without the miracle in the first place they would never see. 1. Give thanks to God for the faith that you have! If you believe in the person and work of Christ it is because God loved you unconditionally before time began in Christ (Eph. 1:3-6). It has nothing to do with anything good in you but everything to do with God’s unconditional electing love in Christ. To God alone belongs the glory in your salvation (Rev. 7:10)! 2. Pray for God to open the hearts of others like he did Lydia in Acts (Acts 16:14). It should give you hope for your loved ones who do not know Christ, no matter how stubborn they are, that faith is a gift from God. If he could open the heart of Saul of Tarsus, who was once one of the greatest enemies of Christ and His church, and transform him into Paul the Apostle, who wrote most of the New Testament and suffered and died for the faith, then surely he can open the heart of your friend or family member who does not know Christ and refuses to repent and believe. And so don’t give up praying for the salvation of your loved ones, (even your enemies! ), who don’t know Christ. Faith is a gift from God. May He be pleased to “kindle in [their] hearts an upright faith, which embraces Jesus Christ with all His merits, appropriates Him, and seeks nothing more besides Him.” Amen!